Scientists. They never seem to realize that certain things shouldn’t be messed with. In this case, things have gone so wrong, that a massive flood has been unleashed, and it may very well spell the end of Gerde’s world! Fortunately, her race is able to harness the power of teleportation, which will help minimize casualties. Sadly, a lot will still end up paying the ultimate price. It can’t be helped. Wow. A game in which a truly happy ending is not achievable. At all. Not exactly something ya see every day, and before this brief experience is over, tens of thousands – maybe even more – will have perished in the flood (may they rest in peace). Exactly how many, depends on your ability to move quickly and turn off a bunch of valves, each of which will lower the water level significantly. Now, I’m not entirely sure how that is supposed to make any kind of sense, but seeing how Gerde has hooks for hands along with this huge creepy grin on her face… yeah, probably best not to ask too many questions. One might think that saving everyone would be a simple task, because, you know, teleportation and all, but no. As is often the case with technology, its use is rather limited. So much in fact, that you can only use it in certain locations, though it certainly made travelling between the background and foreground a breeze (besides, how else would Gerde do that?). Without this technical feat, the world would be doomed for sure. 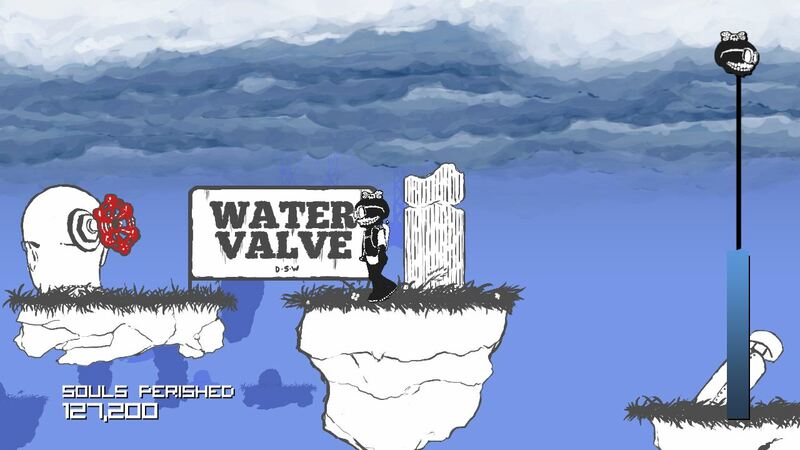 Remember, speed is of the essence since the water level is constantly rising and, well, drowning would be quite bad. This next bit may come as a surprise: Other Space was created for Ludum Dare 26, making it a less-than-48-hour creation. From scratch. Gotta love game jams! So, how about helping Gerde save her world? You know you want to.